That's what I thought too Maggie, in which case it's a Mike Owen shot. I don't think I've seen it before either, though sometimes I say that and I'm proved wrong! Thanks Mike. Found this on the internet. Not seen it befoe anyone know when and where it was taken?? I recognise the dress but not the pictures!! If I had to make a guess, I would say that these pictures were taken on the set of All Kinds of Music. This programme was pre-recorded and broadcast by ITV on Christmas Day 1968. That said, I could be wrong. I recall Dusty sang four songs, but the only one I can remember is This Girl's In Love With You. Dusty's look is very like that used for the cover of Dusty...Definitely issued in November 1968. Paul has a couple of similar shots in 'Looking Good' and the one showing the camera is in 'The Complete'. He lists them as rehearsals for 'It Must Be Dusty', May 68. Both great pics Mike but not new to me. However its good to know more info about them, thank you everyone. For some reason this has appeared twice...............still cannot get enough of DUSTY!! Aw Mike they are absolutely gorgeous. Thanks for sharing, they are all lovely, but the last one is heavenly. Last of the series. Hope you all liked them as much as I do. So good to see "All her Faces"
These are just marvelous. Thank you for sharing. Thoroughly enjoyed them. I bought these photo negatives off Ebay some years ago and had them printed. I think they were taken at The Ideal Home Exhibition and it is Keith Fordyse with Dust...................Sure someone will put me right!! Just one more from the last post...................hope you like them. Awesome pics Mike. 3 out of 4 I hadn't seen before, and the fourth was clearer than I had ever seen before, Thanks a million. Thank you Mike for these, theres three I have never seen, and they are great quality too. Thanks for the pictures Mike and yes it is Keith Fordyce with her. 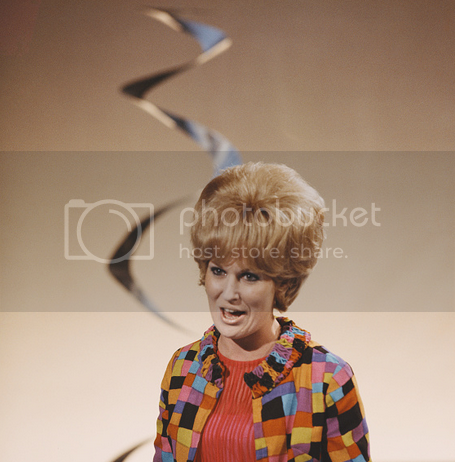 These were new to me, from the Getty site. New to me too Cas. Thanks for finding them. From Thank Your Lucky Stars I see and she is the only female! Wow! Awesome find Cas. Thanks for sharing. 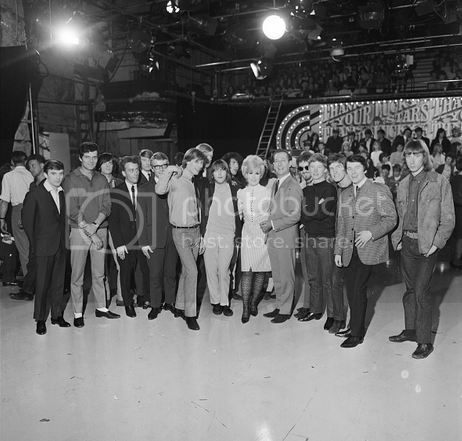 I think that the pictures on the Thank Your Lucky Stars set were from the 200th edition of the show, which was broadcast on 17 July 1965. The reason I can be precise about the date is that I can recall the reason why I didn't get to see the programme. That date was the start of the Glasgow holiday fortnight and my family set off on that very day to fly to the Isle of Man. Moody 15-year old that I was, I was not impressed by taking my first flight in an aeroplane, especially since I was going to miss Dusty's TV appearance. For that edition the show was re-titled as ABC Lucky Stars Anniversary Show. When it was first trailed in the music press, it was said that The Springfields were re-forming for one night just for this show. I think the original idea was to have acts reflecting the period of the show's run. However, in the event, it was a solo Dusty who appeared. I was not very lucky with some of Dusty's 60s TV appearances. In the spring of 1965 our TV set conked out on the day that RSG's Motown Special was due to be broadcast. The first time I got to see the programme was when it came out on video in the 1980s. Jim Dale hosts "ABC Lucky Stars Anniversary Show "; guests include The Beatles (Help! film clip), Kenny Ball and His Jazzmen (Samantha), The Dave Clark Five (Glad All Over), Billy Fury (Like I've Never Been Gone), Mike Sarne (Come Outside), The Searchers with Tony Jackson (Sweets For My Sweet), The Seekers, Helen Shapiro (Walkin' Back To Happiness), Dusty Springfield (I Only Want To Be With You), Mark Wynter (Shy Girl), Jim Dale, Brian Matthew, Pete Murray, Janice Nicholls, Jackie Crier, and the Jo Cook dancers (Sacha Davis, Linda Lawrence, Susan Robinson, Diane South). Carole, you are absolutely correct. I got the two editions mixed up. It looks like Solomon Burke and The Marvelettes didn't hang around for the photograph of the June 26 edition. I don't think I have this one that I can recall. This is a new old photo for me Cas. Thank you for posting it. It amazes me that we still find pics we haven't seen. It's fabulous. No we haven't Clive, well done It looks like the same night as the photo of Elton escorting Dusty. I can't remember if I knew that was to Labelle's party or not. Thank you Clive, great pic and new to me. Same here, thank you Clive! One of the Elton/Dusty photos is on the page before this one Graham. This may be new to some of you. darren2722 wrote: This may be new to some of you. This looks like it's from Pat's wedding in 1970. Here is another photo from Pat's wedding. It's a photo taken of a photo from Pat's album, so the quality isn't great. Peppi is behind Dusty. Great photos, thanks Carole, Frans and Darren. Something I've wondered: wasn't Tom at Pat's wedding? Haven't seen him on any of the photos from the occasion! Brilliant pics Frans & Carole. Love the Pat one Carole new to me. Thank you. Thank you also for posting this last one for me. Great find Caz and Carole. As this photo has appeared in a few places on Facebook today, I thought it should be here too. Taken the same time as the cover photo for 'Where Am I Going', it's attributed to John d Green. Thank you for sharing, Carole. It's very unique. I just remembered this "new to me" one from Brooks Arthur's website. Too bad it's not bigger. Dusty in the hat was new to me when I first saw it on fb. I think its a really amazing pic. It certainly does deserve to be on this thread. This is a fairly "new" old one. When you first sent me this Cor (thank you ), I recognised it as being the same time as the one in DWD that is captioned Aubrey Walk. There may have been a conversation before about that as A. it doesn't look like Aubrey Walk and I seem to remember saying just that previously, and B. it also looks like 77/78 when she was no longer living in Aubrey Walk. Would you say that this is at Norma's house in California? Yes, I know for a fact that this photo was indeed taken at Norma's house in California. Not sure of the exact year, but 77/78 sounds about right, since Dusty has the 'It Begins Again' look and hairstyle. I'd have loved to be a fly on the wall and hear them jamming! You're not the only one Corinna! I just saw your question under the photo of Pat's wedding....I've never seen a photo of Tom there and don't believe he was but I'll ask Pat if you still don't know. I just assumed since Peppi was there, Tom would be, too. But had he been, surely we'd have seen him on a pic? Here's a picture of the Christmas card I posted on another thread, this time without the writing. Thanks for the photos, some of which are new to me. Always good to see new ones. That's freaking awesome Corinna. As a matter of fact, it's spectacular. A new one for me. Love it. Fabulous photo, Mike! And I'm totally in awe of your profile pic. You're a lucky guy!! Here are some more "new old", little seen photos. Party @ Aubrey Walk ca 1970. Perhaps you'll recognise Eric Plant, Dusty's costume designer at Darnell of London. EDITING: Carole G pointed out on FB that the guy in red pants very probably is John Adams. Thanks, Carole! Great picture Mike , thank you And Cor too how many more are we going to see..? thank you too. Great pics Cor , nice to see them all on here as well as fb. She certainly got her money's worth out of that wig!! I would post a couple of pictures that I have from one of the dinners there. posted as I don't like to throw things out and these have a lot of memories for me. on the right. 2nd picture is of Wendy sitting in the Aarnio Ball Chair that was in the lounge. Thanks Douggie, I love to see these pics of Dusty in a much more relaxed and "normal" situation. Interesting to see inside the Aubrey flat and I hope you will post more photos of the Echoes and of course Dusty. A BIG thank you!! Thank you for posting these Douggie. The first of your pics appeared on fb a little while ago Douggie. It would indeed be lovely to see more casual pics. thank you. Thank you so much Douggie for sharing. They are marvelous to see. A real treasure for all Dusty people. How generous of you to share your Dusty memories. And it is always a big thrill indeed to see photos I have never seen before. Cas19 wrote: The first of your pics appeared on fb a little while ago Douggie. It would indeed be lovely to see more casual pics. thank you. Thank you for your comments. I don't think that I have ever posted these or many pictures of the others I have of Dusty, I would have sent Pat & Dusty copies maybe that was the source. They were taken on a little Kodak camera Wendy had, which I think is still around here somewhere. I know that I didn't know how to post any pictures on this site until quite recently late last year, but anyway it doesn't matter. When you get over thirty you start to forget things and I have just had yet another birthday so that's my excuse. I know that quite a few pictures of Dusty and me are on the web site many that I can't remember having been taken, but great to see them. I will maybe put up some more when I go through them again. Not too sure which ones yet. By the way what is fb??? This is a a bit of a mystery as I know I never posted it on Facebook (fb which I realized later) neither did Wendy but she is not sure if she may have sent it to Pat or somebody else who may have put it up, but anyway it is out there now. Lots of memories for everyone! The chair was a bit of a problem! Coincidentally, The Guardian Weekend magazine on Saturday had an advert for a sale of iconic items of furniture by 28 January. The reason for the sale is stated to be a change in copyright law which means that the items shown cannot be legally sold after that date. Among the items listed is The Bubble Inspired Chair, based on an iconic design by Eero Aarnio in acrylic and chromed steel. Previously on sale for £1,745, it was offered to Guardian readers for £424. The advert is reproduced below. If you click on it, it will appear in an enlarged form and the right way up! 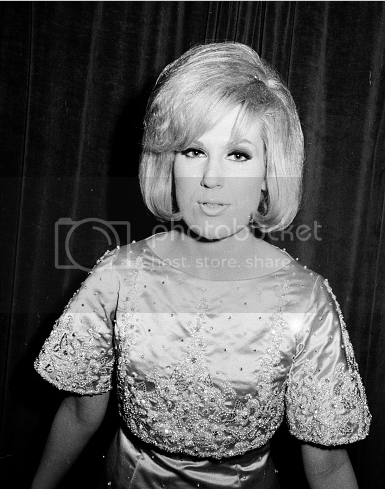 In the winter of 1966/67, when Dusty starred in the pantomime Merry King Cole in Liverpool. she didn't take on a character but had a singing spot as herself. She did lead some 'community' singing though with a big stick and giant screen with the words on :) I saw the panto a few times but never expected to see a photo of Dusty with that screen, so this was a nice surprise. You can purchase a copy of this photo, (without the watermark obviously), from mirrorpix. I bought this poster some years ago off Ebay and put it away in a cupboard.Came accross it while tidying the other day. It measures 15 X 22 1/2 inches........38cm X 57cm. 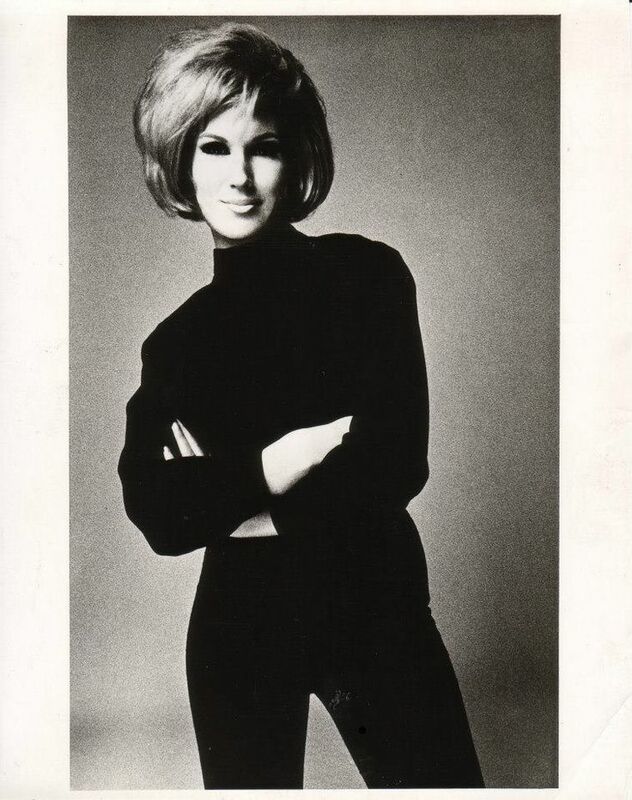 Dusty only did one show in Seattle 2nd May 1969, according to the Complete Dusty Springfield.Interesting that it was a Bon Marche Spotlight Series Attraction and that tickets were available from that store. It is not in too bad a condition considering it is 48years old. Thought I would share it with LTD. This item is up for sale at Ebay at £9.50. Originally printed in 2010. It would be great if Dusty was celebrated by the Post Office on a set of stamps.There must be loads of icons photo available that would fit the bill. Yes I'd love a set of official Dusty stamps too, which photo would we choose! I'd love to see Dusty on a stamp too, it could happen. I think this image below would be good , also the A Girl Called Dusty LP cover shot. Just to add I think Dusty's best chance of being featured on a UK postage stamp is if Royal Mail were to issue a series celebrating the history of the UK pop music industry. i.e if Dusty were one of several pop acts featured on individual stamps e.g one stamp featuring the Beatles, one of David Bowie , one of Dusty etc. A dedicated Dusty issue I don't think would happen as there are so many pop acts who could claim similar recognition. Another chance would be a series celebrating female artists in various fields of the arts. I also think the photo on the cover of A girl Called Dusty would be good ..................but I really like the photo below. 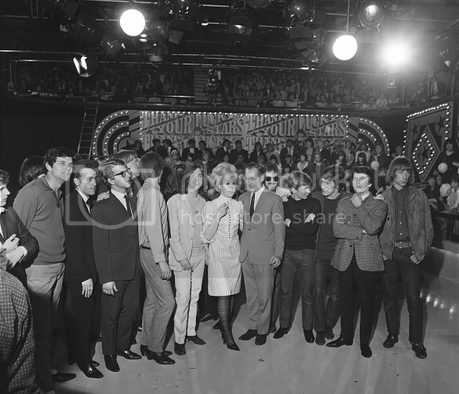 The first time I saw that image was at "The Talk of The Town" London, it was a life size cardboard cutout of our girl.I asked Pat was it available but was told that Dusty had promised it to Fred Perry.Where is it now? ?My night was made up as I met dusty back stage and took lots of pics. 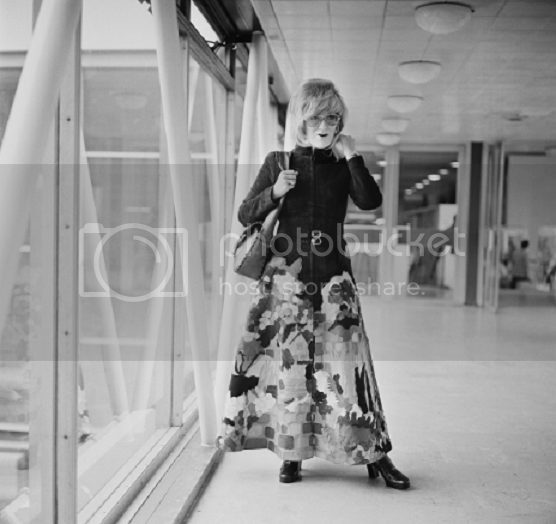 We had travelled from B'ham to London and by the time we had been back stage the last train had gone.Pat was so kind and said we could stay at hers, not sure if she remembers this, but Dusty had left her makeup case in the dressing room, Pat said that she would have to drop it off on the way home. She made us both promise not to let anyone know where Dusty was living.I think I remember this correctly, Pat had a parrot in her lounge,perhaps Pat will confirm that one day ,she may have been looking after it for a friend.......not sure. Maybe Douggie would know?? Yes Mike, I can definitely see that one on a stamp, classic image. Seen this one before Clive but not so good quality, thank you. This Getty image was new to me though I have seen similar. thanks Carole and Cas. Don't remember ever reading of Dusty performing with Harry Rabinowitz Orchestra, presumably for TV? SHOWN THIS ONE BEFORE MY FAV!! Unbelievable photos!!! I can never get enough of them. You're so lucky, Mike! And very handsome! Thanks for posting these Mike. Always nice see photos with fans. Found a great pic of Dusty and Engelbert , presumably rehearsing for "Ain't no mountain high enough", but it is in Jxr rather than Jpeg and won't allow copy. Any thoughts you techies? Btw way I'm on Win 10.